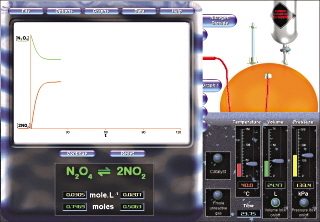 By analysing the hydrogen iodide and nitrogen dioxide reactions your students can investigate the physical and chemical factors that influence chemical equilibrium. Gas changes are easily observed as the flask changes colour in response to NO2 and I2 concentrations. Before and during the experiments students can change gas concentrations, volume, pressure and temperature, add an inert gas and introduce a catalyst. 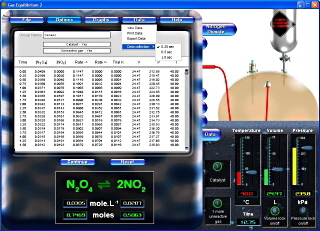 The software can be used to investigate how conditions affect the reaction rate graphs. Data and graphs can be viewed as they are generated. The data can be saved or printed out for later analysis. 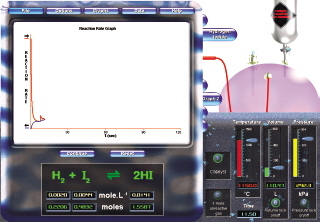 Extensive resources are included for the teacher including 17 experiments that cover in detail the quantitative and qualitative aspects of equilibrium reactions and Le Chatelier’s principle. The blackline masters make lesson planning simple!